Home / Life & Culture / When You Can’t Do an Island Vacation, Bring One to You! As we settle into summer and the tans of spring break have faded, we start longing for our next sandy, sunshiny getaway. While many of us are putting the finishing touches on summer travel plans, some of us may feel trapped by circumstances that limit our vacation time. We yearn for quiet days and salty hair but are ever pressed by to-do lists and tight budgets. I know routine and lack of adventure can easily bog me down, especially when my newsfeed seems to be filled with pictures of extravagant trips that I can’t take. I was lucky to get an unexpected getaway to the Bahamas this spring, but due to family changes, our full time jobs, and time needed to devote to my husband’s schooling and my best friend’s wedding, we have to wait even longer than we thought we would for the vacation we desire. Luckily we are in Florida, so we do not lack in sunshine! But replaying my dreamy Bahamas photo album of blue waves, pineapple-everything, and new swimsuits got me thinking: how could one cultivate the island-y feels on any given day? I discovered that with a tiny bit of effort, we could all bring an island staycation close and escape (even for just a little bit) with any amount of time despite our pressing responsibilities. Here are 9 ways to bring an island vacation to you! 1. Bring out the essentials. 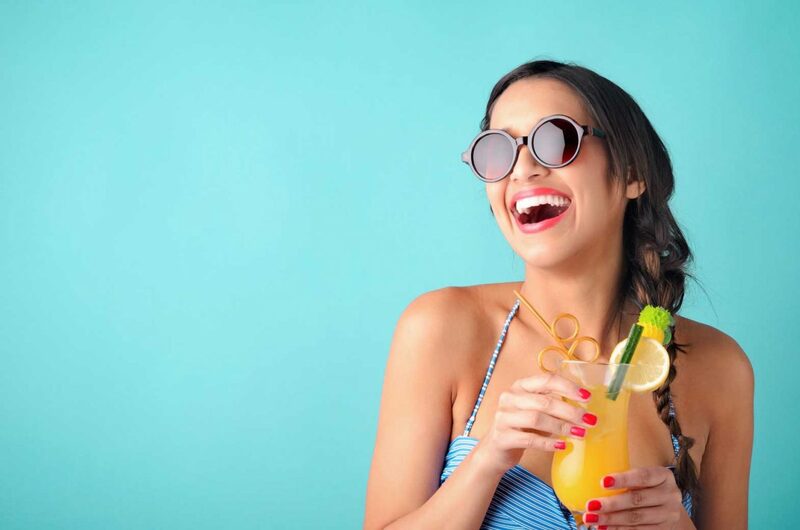 Tanning oil, beach chairs, towels, and umbrellas are must-haves to soak in some rays waterside or in the back yard, and sunscreen is especially necessary to protect your lovely face! Even better, get yourself a wide brimmed straw hat to really bring out your inner island-girl. 2. Slip into something that suits you (pun intended) and let some Vitamin D in all over. Uncover a long-lost bathing suit, or buy a new one; Old Navy and Aerie have great, budget-friendly basics in all styles and sizes right now! Add in a frilly cover-up or sundress and you are all set. 3. Get to the water (or get it close to you). If you have a pool or live close to the beach/lake/river, adding in the other items on this list will surely send you to your own island of bliss. If not, break out a kiddie or inflatable pool to splash around in, or get a mister to keep cool. 4. Become your own bartender. Fire up the blender and mix up some fruity concoctions to sip on in the sun. Frozen fruit and cream of coconut have endless possibilities (mini-umbrellas and coconut rum are optional). I may be the only 23-year-old to suggest the Beach Boys! Regardless, find some island music that you don’t typically hear in your day-to-day, or think of the songs that remind you of times with no responsibility and lots of fun. I am also not opposed to using the speakers to play wave sounds, either! Leave your phone inside. Let all unanswered questions and attention-grabbing social media posts wait as if you don’t have cell service anyway (you’re on a far-away island remember?). Your heart and mind will be thankful. Take a walk to appreciate the nature and details around you as if you were a visitor. Snap photos of the different things you notice, like bright blooms or pretty architectural details. 8. Treat yourself to a seafood dinner. Get out to a quality restaurant and order something tasty from the sea (local if possible). If you are near the coast, you may be lucky enough to sit on the water or get high quality with a lower price-point. Don’t forget a dessert! Remember, this is vacation, so calories don’t count today. 9. Put on a spirit of rest and slowness. If nothing else, relax. Don’t set up a schedule and don’t check the time (unless it’s to flip for an even tan). Focus on your increasing tan lines, cool water on warm skin, and the smell of sunscreen and coconuts. Everything else can wait until you get back to reality. For now, your only responsibility is to enjoy the lovely details of the present moment.